The sponges or poriferans (from Latin porus meaning "pore," and ferre meaning "to bear") are invertebrates of the phylum Porifera. They are primitive, sessile, mostly marine, water-dwelling filter feeders that pump water through their bodies to filter out particles of food matter. Sponges represent the simplest of animals. With no true tissues (parazoa), they lack muscles, nerves, and internal organs. Among animals, sponges are the only group that exhibits true asymmetry, rather than a radial, bilateral, or spherical symmetry. Sponges' porous nature (thus the name "pore-bearer") allows their practical use as household "sponges" to soak up and release water, having been harvested for this purpose since ancient times. Their diversity of forms and colors, with almost all colors of the rainbow represented, provides aesthetic appeal to humans. Sponges similarity to colonial choanoflagellates (protists) shows the probable link or evolutionary jump from unicellular to multicellular organisms. As sessile animals, which attach themselves to surfaces and do not move, as opposed to chasing and capturing food, early biologists thought they were plants (Towle 1989). The larvae are free-swimming. There are over five thousand modern species of sponges known, and they can be found attached to surfaces anywhere from the intertidal zone to as deep as 8,500 meters (29,000 feet) or further. Though the fossil record of sponges dates back to the Neoproterozoic era, new species are still commonly discovered. The cells of sponges are arranged in a gelatinous non-cellular matrix called mesohyl. Choanocytes (also known as collar cells) are flagellated cells that function as the sponge's digestive system and are remarkably similar to the protistan choanoflagellates. The collars are composed of microvilli and are used to filter particles out of the water. The beating of the choanocytes’ flagella creates the sponge’s water current. Porocytes are tubular cells that make up the pores into the sponge body through the mesohyl. Pinacocytes form the pinacoderm, the outer epidermal layer of cells. This is the closest to true tissue in sponges. Myocytes are modified pinacocytes that control the size of the osculum and pore openings and thus the water flow. Archaeocytes (or amoebocytes) have many functions; they are totipotent cells that can transform into sclerocytes, spongocytes, or collencytes (see below). They also have a role in nutrient transport and sexual reproduction. Sclerocytes secrete calcareous or siliceous spicules (see below), which reside in the mesohyl. Spongocytes secrete spongin, collagen-like fibers which make up the mesohyl. Spicules are stiffened rods or spikes made of calcium carbonate or silica that are used for structure and defense. Sponges have three body types: asconoid, syconoid, and leuconoid. Asconoid sponges are tubular with a central shaft called the spongocoel. The beating of choanocyte flagella forces water into the spongocoel through pores in the body wall. Choanocytes line the spongocoel and filter nutrients out of the water. Syconoid sponges are similar to asconoids. They have a tubular body with a single osculum, but the body wall is thicker and more complex than that of asconoids and contains choanocyte-lined radial canals that empty into the spongocoel. Water enters through a large number of dermal ostia into incurrent canals and then filters through tiny openings called prosopyles into the radial canals. There food is ingested by the choanocytes. Syconoids do not usually form highly branched colonies as asconoids do. During their development, syconoid sponges pass through an asconoid stage. Leuconoid sponges lack a spongocoel and instead have flagellated chambers, containing choanocytes, which are led to and out of via canals. Sponges have no true circulatory system; however, the water current is used for circulation. Dissolved gases are brought to cells and enter the cells via simple diffusion. Metabolic wastes are also transferred to the water through diffusion. Sponges pump remarkable amounts of water. Leuconia, for example, is a small leuconoid sponge about ten centimeters tall and one centimeter in diameter. It is estimated that water enters through more than 80,000 incurrent canals at a speed of six centimeters per minute. However, because Leuconia has more than two million flagellated chambers, whose combined diameter is much greater than that of the canals, water flow through chambers slows to 3.6 centimeters per hour. Such a flow rate allows easy food capture by the collar cells. All water is expelled through a single osculum at a velocity of about 8.5 centimeters per second: a jet force capable of carrying waste products some distance away from the sponge. Sponges have no respiratory or excretory organs; both functions occur by diffusion in individual cells. Contractile vacuoles are found in archaeocytes and choanocytes of freshwater sponges. The only visible activities and responses in sponges, other than propulsion of water, are slight alterations in shape and closing and opening of incurrent and excurrent pores, and these movements are very slow. Sponges have remarkable powers of regeneration; indeed, a small piece of a sponge can regrow a complete new organism (Towle 1989). In some species, this includes particles small enough to pass through a cloth strainer (Towle 1989). Sponges share many characteristics with colonial protists, such as Volvox, though they have a higher degree of cell specialization and interdependence. Even so, if a sponge is placed in a blender, any surviving cells can reform a complete organism. If multiple sponges are blended together, each species will recombine independently. 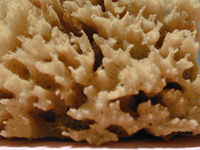 Some taxonomists have suggested a fourth class, Sclerospongiae, of coralline sponges, but the modern consensus is that coralline sponges have arisen several times and are not closely related (Brusca and Brusca 2003). In addition to the three extant classes of sponges, a fourth class has been proposed of fossil animals, Archaeocyatha. While these ancient animals have been phylogenetically vague for years, the current general consensus is that they were a type of sponge. Although 90 percent of modern sponges are demosponges (see above), fossilized remains of this extant type of sponge are less common than those of other types, since their skeletons are composed of relatively soft spongin that does not fossilize well. The fossil Archaeocyantha have skeletons that are solid, rather than separated into spicules. Similar fossil animals known as Chancelloria are no longer regarded as sponges. The fossil record of sponges is not abundant, except in a few scattered localities. Some fossil sponges have worldwide distribution, while others are restricted to certain areas. Sponge fossils such as Hydnoceras and Prismodictya are found in the Devonian rocks of New York State. In Europe, the Jurassic limestone of the Swabian Alps are composed largely of sponge remains, some of which are well preserved. Many sponges are found in the Cretaceous Lower Greensand and Chalk Formations of England, and in rocks from the upper part of the Cretaceous period in France. A famous locality for fossil sponges is the Cretaceous Faringdon Sponge Gravels in Faringdon, Oxfordshire in England. An older sponge is the Cambrian Vauxia. Fossil sponges differ in size from one centimeter (0.4 inches) to more than one meter (3.3 feet). They vary greatly in shape, being commonly vase-shapes (such as Ventriculites), spherical (such as Porosphaera), saucer-shaped (such as Astraeospongia), pear-shaped (such as Siphonia), leaf-shaped (such as Elasmostoma), branching (such as Doryderma), irregular or encrusting. Detailed identification of many fossil sponges relies on the study of thin sections. Sponges are able to reproduce sexually or asexually. Asexual reproduction of sponges is through budding (formation of a new organism by the protrusion of part of the adult organism) or fragmentation (when a small piece of sponge falls off of the main sponge and grows into a new one). Many freshwater sponges also form small structures known as gemmules, which are made up of amoebocytes surrounded by a protective coating consisting of organic material and layer of spicules. These may function as a means of surviving harsh conditions that may kill the adult sponges that gave rise to them. When the environment becomes less hostile, the gemmule resumes growing. These are similar to a bacterium's endospore. Most sponges are monoecious, having unisexual reproductive units of both sexes appearing on the same plant. An organism that produces both eggs and sperm is known as an hermaphrodite. Some species have separate sexes. Sperm are formed from choanocytes. Oocytes (female germ cells) derive from choanocytes in some sponges and archaeocytes in others. Sperm are released into open water. Some sponges have oviparous fertilization where sperm and eggs meet in open water. In other species, sperm are taken into the bodies of other sponges and fertilized inside; this is known as viviparous fertilization. Self-fertilization rarely, if ever, occurs in species that produce both sperm and eggs in the same organism (Towle 1989). Eggs develop into an immature, free-swimming larvae. These larvae, known as parenchymula, have flagella for movement and serve as one of the main forms of dispersal for this largely sessile phylum. It will eventually attach to an object and undergo a transformation to the sessile, adult form. Modern sponges are predominantly marine, with some 150 species adapted to freshwater environments. Their habitats range from the intertidal zone to 8,500 meters. Certain types of sponges are limited in the range of depths at which they are found. Sponges are worldwide in their distribution, and range from waters of the polar regions to the tropical regions. Sponges are most abundant in both numbers of individuals and species in warmer waters. Adult sponges are largely sessile, and live in an attached position. However, it has been noted that certain sponges can move slowly by directing their water current in a certain direction with myocytes. The greatest numbers of sponges are usually to be found where a firm means of fastening is provided, such as on a rocky ocean bottom. Some kinds of sponges are able to attach themselves to soft sediment by means of a root-like base. Sponges also live in quiet clear waters, because if the sediment is agitated by wave action or by currents, it tends to block the pores of the animal, lessening its ability to feed and survive. In common usage, the term sponge is usually applied to the skeletons of these creatures alone, from which the animal matter has been removed by maceration and washing. The material of which these sponges are composed is spongin. The calcareous and siliceous classes of sponges (see taxonomy above) are too harsh for similar use. Commercial sponges are derived from various species and come in many grades, from fine soft "lamb's wool" sponges to the coarse grades used for washing cars. However, the luffa sponge, also spelled "loofah," commonly sold for use in the kitchen or the shower, is not related to any animal sponge but is derived instead from the locules of a pepo fruit (Cucurbitaceae). 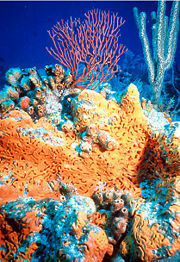 Marine sponges come from fisheries in the Mediterranean and West Indies. The manufacture of rubber, plastic, and cellulose based synthetic sponges has significantly reduced the commercial sponge fishing industry over recent years. Additionally, synthetic sponge products can be up to 10 percent more effective at retaining liquids, as compared to a natural sponge. The ability of sponges to regrow missing parts (regeneration) has led sponge divers to replenish natural resources by cutting sponges into pieces, weighing them down, and placing them back in the sea to regenerate (Towle 1989). Brusca, R. C., and G. J. Brusca. 2003. Invertebrates, 2nd edition. Sunderland, MA: Sinauer Associates. ISBN 0878930973. Hickman, C., L. Roberts, and A. Larson. 2003. Animal Diversity, 3rd edition. New York: McGraw-Hill. ISBN 0072349034.